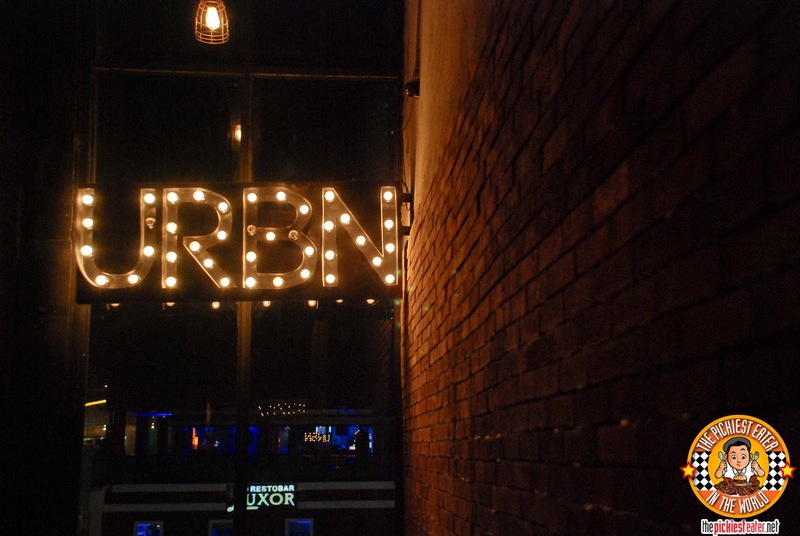 It's called URBN Bar and Kitchen, because later that evening I found there to be a delineation between the restaurant section and the Bar. The closest area to the entrance serves as the bar section (And If I recall correctly, you can smoke inside.. but I'm not sure.. never really bothered to ask), while the further end that serves as the restaurant is (thankfully) separated by a glass partition. The look of the place is luxury meets industrial. 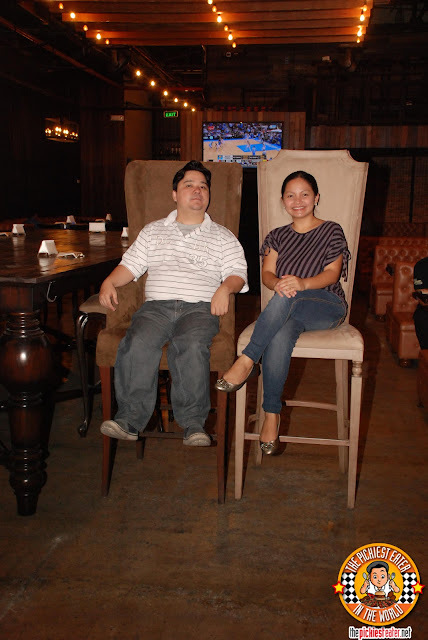 The bar has gorgeous, over sized Baroque furniture, that made Rina and I feel even more diminutive than usual. Don't laugh! Whatever I lack in height, I more than make up for in weight! Umm.. Wait.. That's not exactly a good thing. 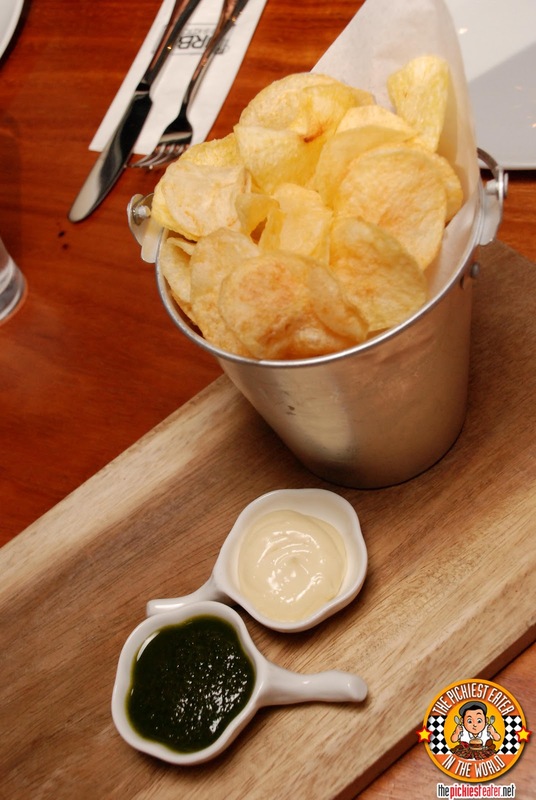 Never mind..
As we waited for the meal to begin, we were served some of URBN's Home Made Potato Chips (P250). 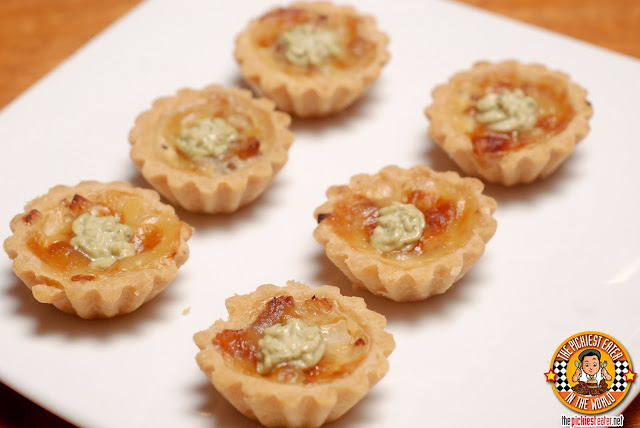 This were thinly sliced potato crisps, salted just right, and served with a pesto or aioli dip. One bucket wouldn't have been enough for me, because my mommy taught me how to "share" (pssh). 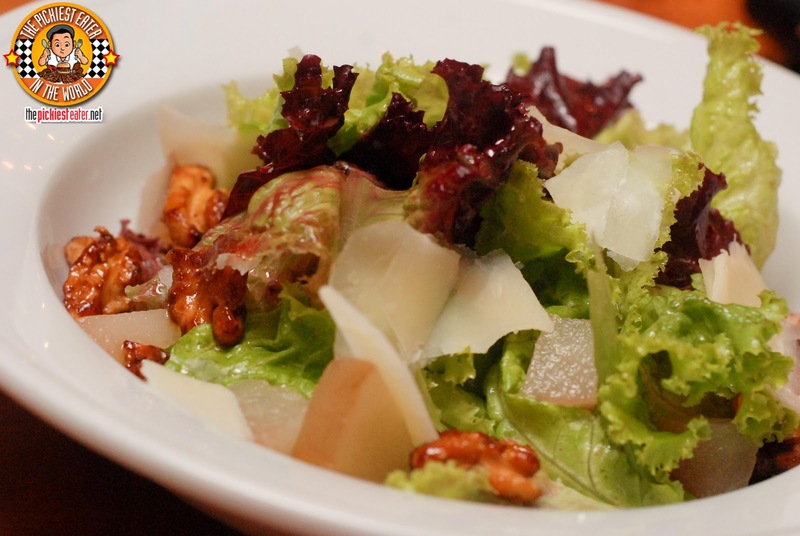 To kick off the meal, URBN served their House Salad (P220), which was.. a bunch of green stuff, mixed with poached pears, candied walnuts, shaved parmesan cheese and drizzled with a raspberry vinaigrette. Surprisingly, I found it to be one of the better salad's I've ever tasted, because it had a nice mix of sweetness and acid. Still, I honestly didn't dig in too deep into this, because I was saving my stomach space of what was to come. Ever since I got Rina into Hell's Kitchen, she's had a fascination with Scallops. I personally wasn't fond of it because I wasn't too big on scallops to begin with, but Rina really enjoyed it. 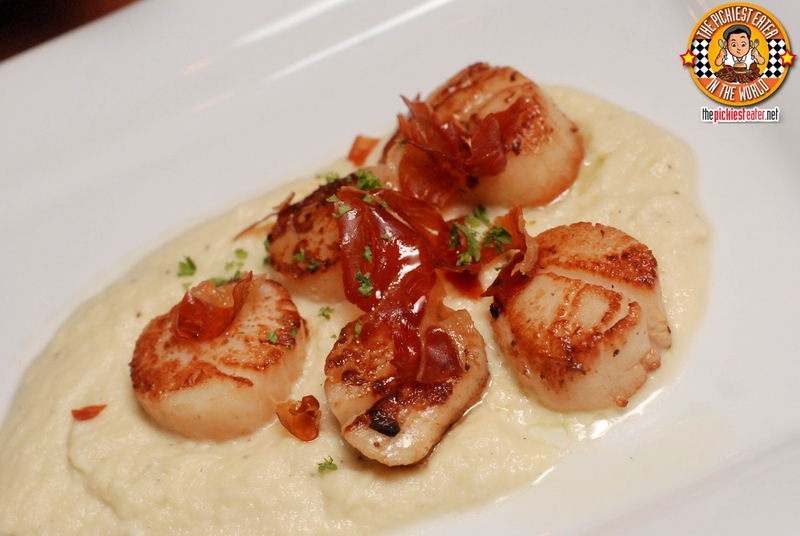 The Seared Scallops (P390) were laid out on a bed of Cauliflour Puree' and topped with bits of Jamon Serrano. I could have polished off the plate of Caramelized Onion and Bacon Quiche (P260) all by myself, but my mom always taught me to be mindful of companions (there's that whole "sharing" thing again.. whateva). It had a nice butter crusty, and the blend of the sweet onions and the bacon blended nicely with the pesto cream cheese topping. 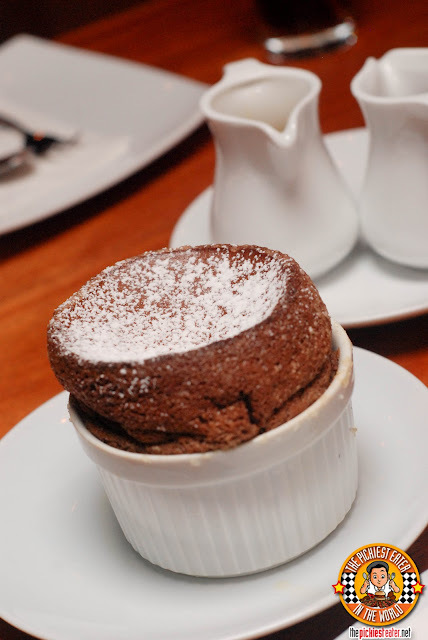 I also really enjoyed the Manchego Souffle (P395). 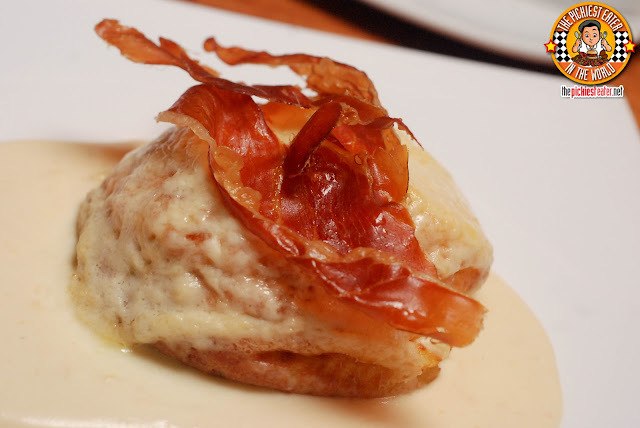 It was a nice, fluffy cheese souffle, bathed in a rich truffle cream sauce, and Jamon Serrano strips. The Jamon Serrano adds a punch of flavor to the souffle, which is made of Manchego Cheese, which is more known for its buttery, but a bit subdued flavor . 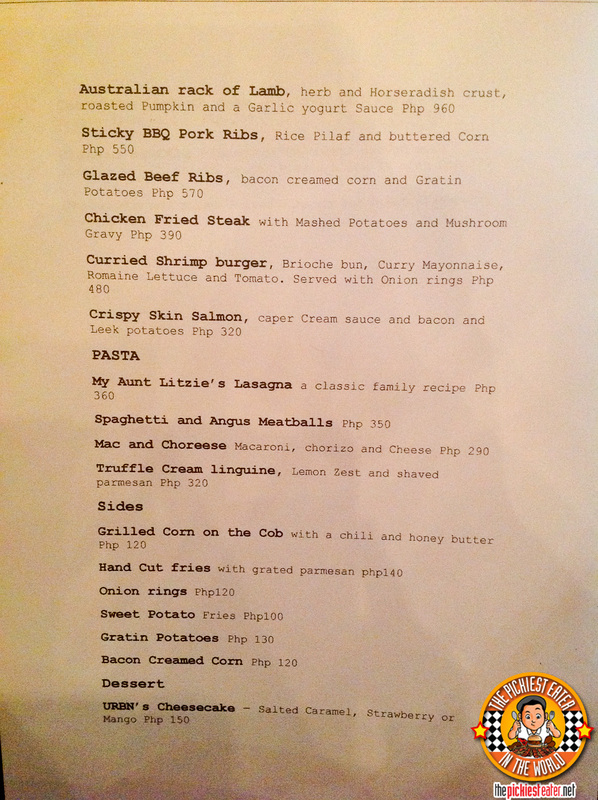 I was happy that they brought out mini versions of their burgers, particularly the Black Benny Angus Burger (P550). 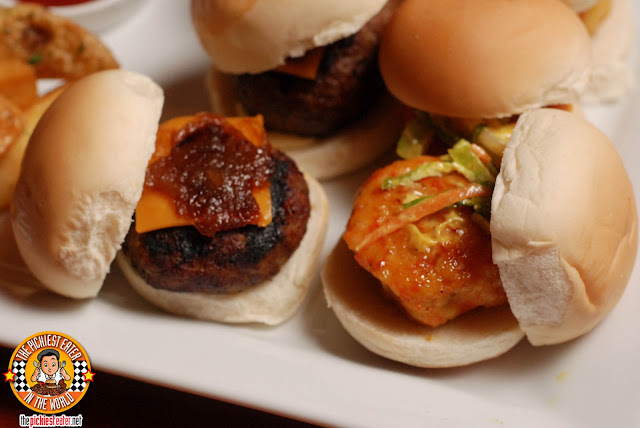 Even as a slider, you couldn't deny the meatiness of the beef patty. And I feel that the onion jam, on the cheddar cheese, with a strip of bacon sounds like something straight out of the Pickiest Eater playbook. The other mini burger they served was the Curried Shrimp Burger (P480). Rina like the crispy Shrimp patty, that went well with the lightly sweet curry sauce. 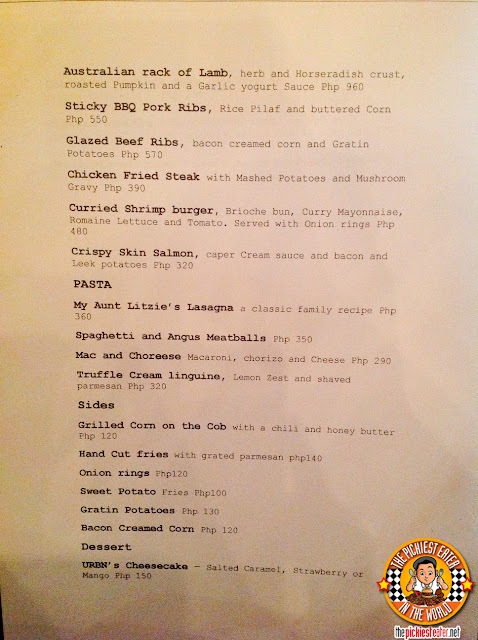 Something that blew my mind from the very first bite, was the Mac & Choreese (P290). It takes the timeless concept of the good old fashioned Macaroni & Cheese, but instead of using ground beef, URBN replaces it with crumbled Chorizo. And much to my delight, they used more of a tomato cream sauce, then a tomato sauce heavy on the acid, making it much better for my tummy. 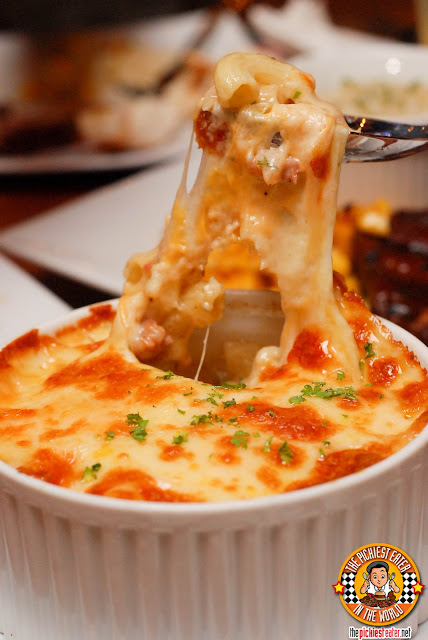 The melted cheese, coupled with the prominent flavor of the Chorizo, and the creamy tomato sauce.. Like I said.. MIND. BLOWN. Many are surprised when they find out that Chicken Fried Steak is actually made of beef, not chicken. The name is derived from the preparation, which is more or less like Southern Fried Chicken. 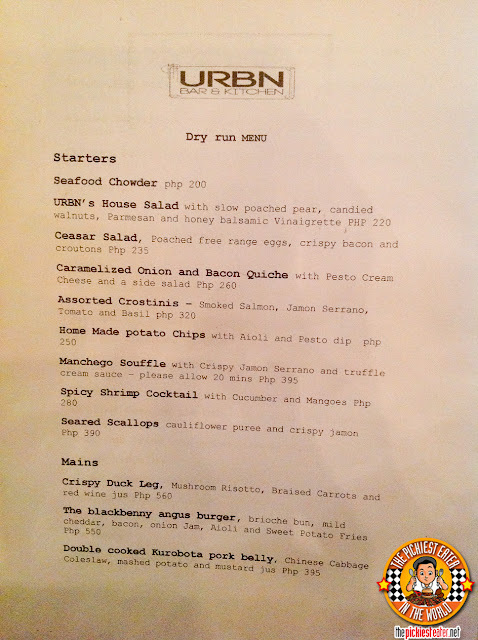 I'm a big fan of Southern Cooking, and URBN's Chicken Fried Steak (P390) had that rustic flavor that I was looking for. The meat was incredibly tender and was cooked beautifully, although it admittedly could have used a couple pinches less salt. When you eat it with the mash potatoes, however, it kind of balances out (But I still think they could ease up on the salt a tad). 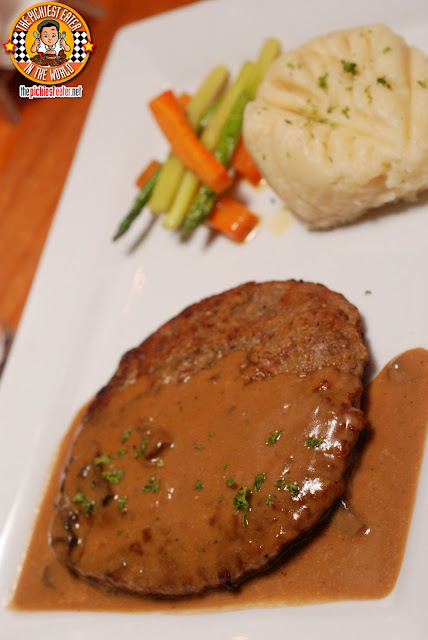 The steak is then bathed in a thin mushroom gravy, that rounds out a nice dish. In case I haven't made it clear with my previous posts, I'm a ribs guy. Baby Back, Pork, Beef, you name it. Let's just say that it's fortunate that it was Adam that was the first man God made instead of me, because I wouldn't have given up my ribs without a fight. The entire existence of the human race would've been put to jeopardy right there. 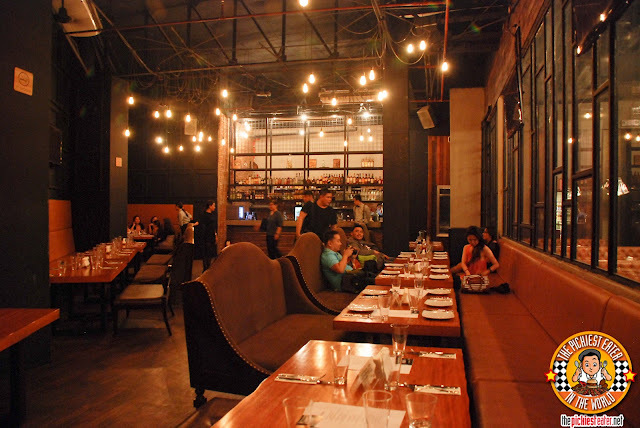 Count on the Sticky BBQ Pork Ribs (P550) of URBN to reaffirm that notion for me. 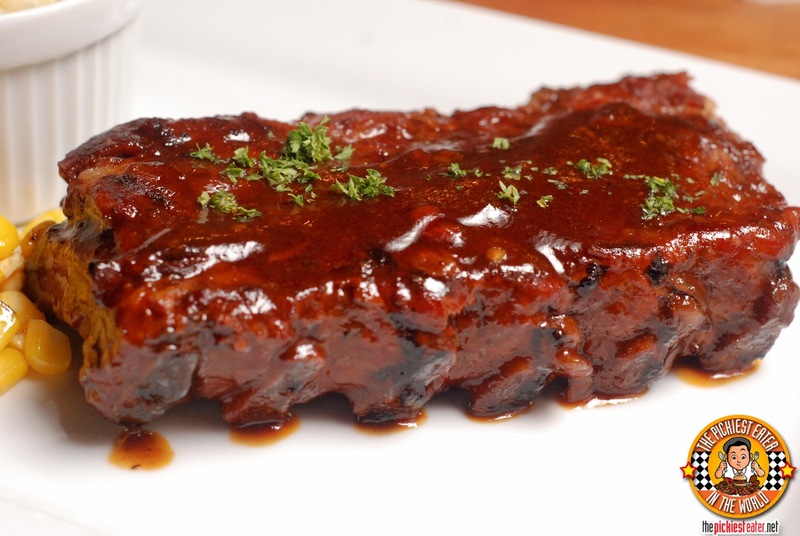 The thickness of the ribs made it evident that the cut they used was thick and packed with meat, and not all bones as some restaurants try to serve. It had a generous coating of BBQ sauce around it, that added a sweet but smokey touch to the flavor of the meat. The meal is served with buttered corn and a rice pilaf. 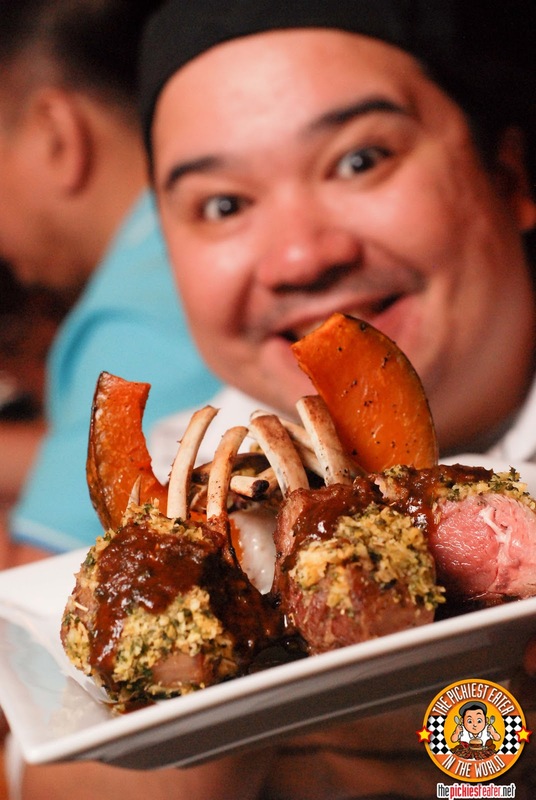 URBN's Australian Rack of Lamb (P950) caused jaws to drop down the to the floor upon its unveiling. 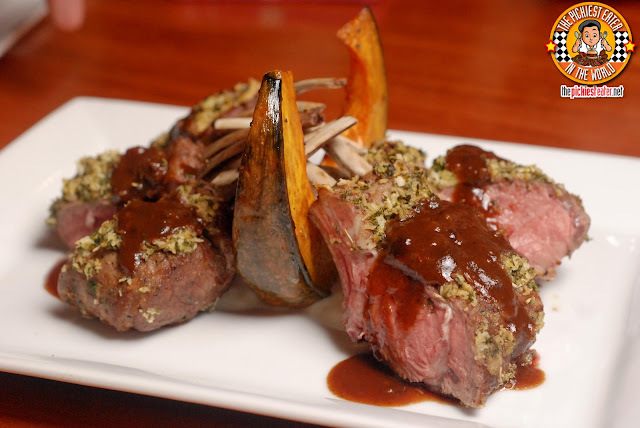 Beautiful cuts of lamb, with its edges lightly caked in a horseradish crust, and drizzled in a garlic yogurt sauce, with a slice of roasted pumpkin as the centerpiece to the platter. I would have preferred the lamb cut a bit more through, although many agree that medium rare is the ideal temperature for it. Nonetheless, it was still a hit for me. The gaminess of the lamb served as a nice base for the horseradish based crush, and the yogurt sauce was a nice punctuation to the flavors. 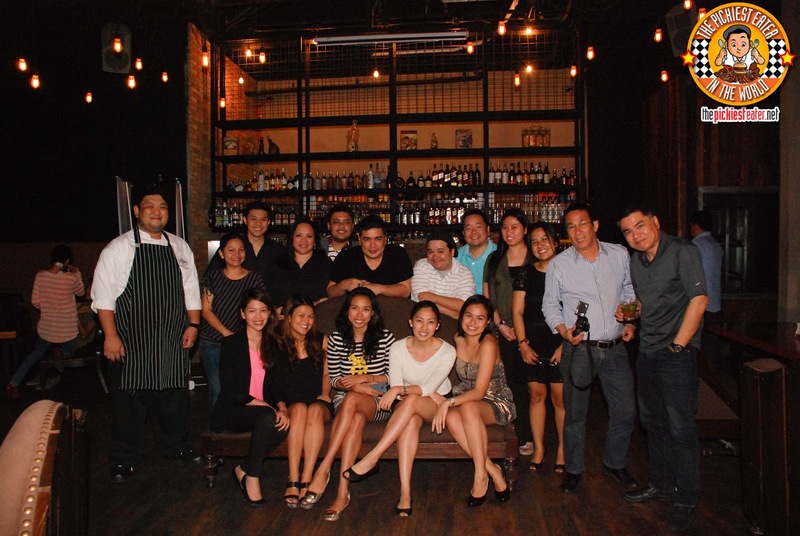 After all the dishes they served, especially the Lamb, you'd think there was no way URBN could top that, right? 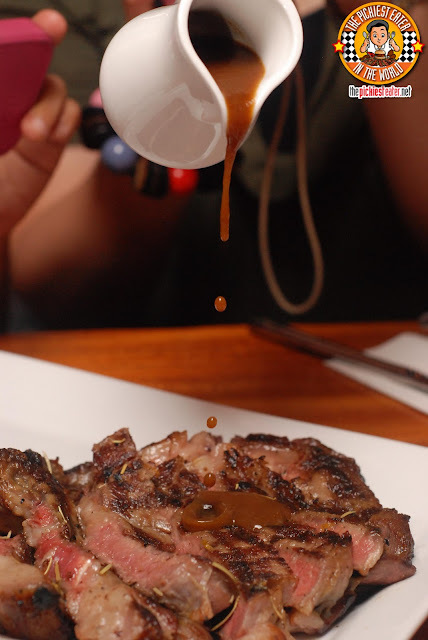 Apparently, URBN was just getting us warmed up for the crown jewel of the evening, The Dry Aged, Bone-in Rib Eye Steak. I had a dry aged steak a few months back (I haven't written about it yet.. my backlog is ridiculous, I know) and, although it was delicious, I felt I would prefer the traditional type of Rib Eye Steak instead. But this made me change my mind. I think this had the perfect fat to meat ratio I've ever seen in the steak.. Meaning there was a whole lot of fat. That alone gives it a gold star in my book (If I had a book). Although it came with a gravy sauce, the natural flavor of the beef was so pronounced, it tasted even better alone. The exterior had gorgeous charred marks on it, yet the meat itself managed to stay at a stunning medium rare. The beef was incredibly tender and the fat ensure that it stayed phenomenally juicy as well. I came here expecting a bar, but little did I know, I'd find one of the best steaks I've ever had in Metro Manila. If you want to see Rina do a triple back flip with a full twist and straight landing, say the words "Salted Caramel" to her. Which was exactly her reaction when she asked the waiter what kind of Cheese cake they brought out, and he replied, "Salted Caramel Cheesecake Ma'am". The Salted Caramel Cheesecake (P150) is just one of URBN's cheesecake variants (They also have strawberry and Mango). 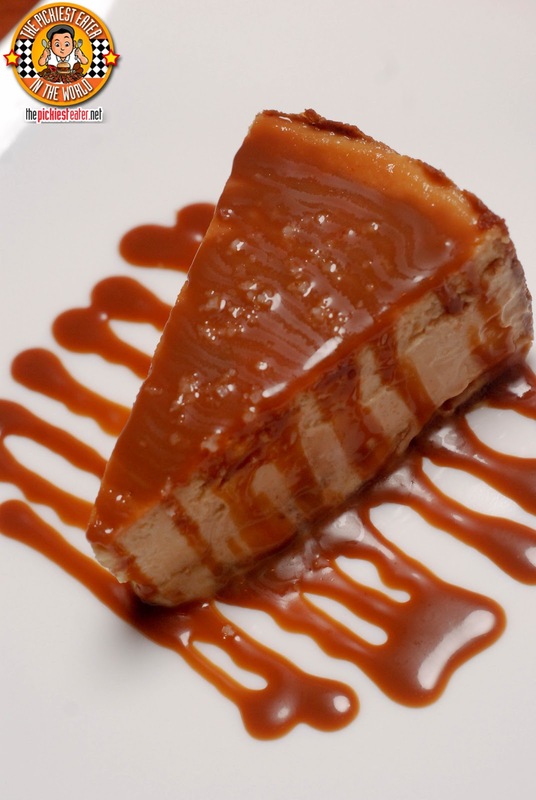 The light tartness of the cheesecake, was smothered by the silky salted caramel, to make a sensation dessert that left Rina mesmerized. 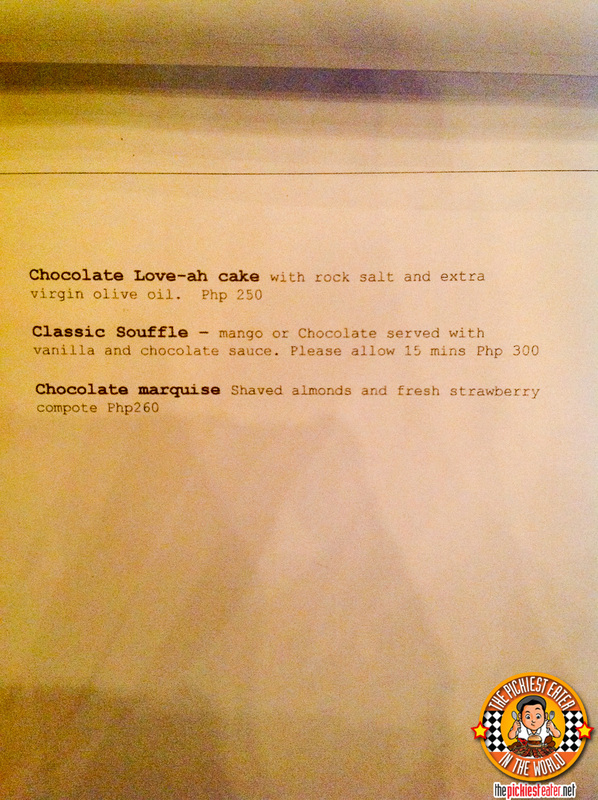 Although they also had a chocolate variant, I was more drawn to the Mango Souffle (P300). It had a certain lightness to it that really warmed up to my taste buds. A gentle touch of sweetness that was complimented by the Vanilla sauce, made this the ideal way to end my meal. After everything I had eaten, I said I had no room for any more food. 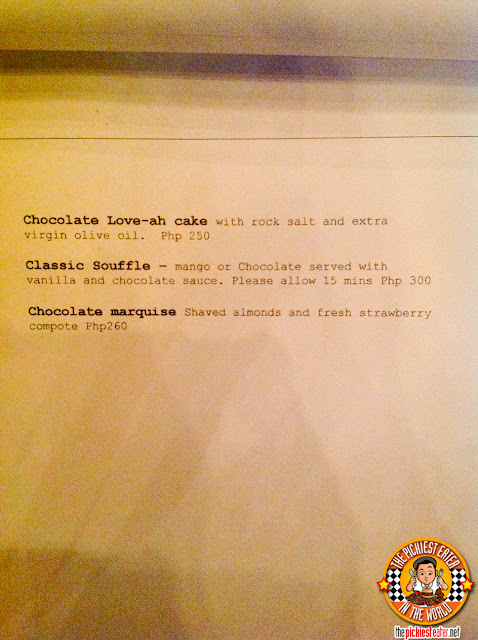 But unfortuantely, the Chocolate Love-ah (P250) called my bluff. 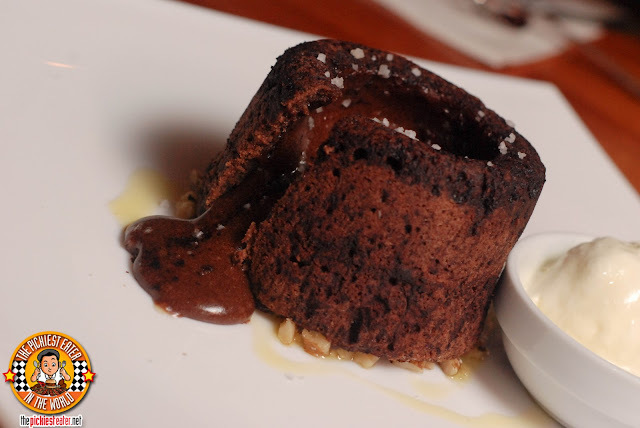 In theory, I was full, but there was no way I could pass up a chocolate molten lava cake laying in a light drizzle of olive oil and a sprinkling of rock salt. It sounds strange, I know, but it just worked. Like I mentioned, I really don't go out much at night, but the next time someone asks for a suggestion of where to hang out or something, I would now definitely recommend URBN. Prices are a bit on the steeper side, but at the same time, nothing really totally outrageous. 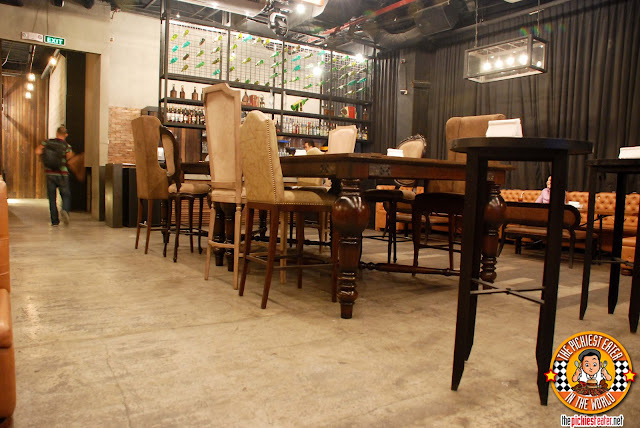 But if you stop to think about it, from the quality of the food, to the ambiance, you know it's money well spent. and the amazing Chef Benjo for a phenomenal evening! 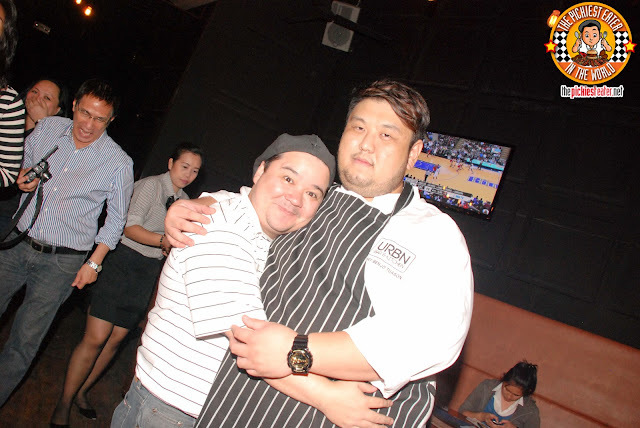 it was Rhianna's "We found Love In A hopeless Place" song that was blaring on the radio as I went in for a bro-hug with Chef Benjo. I assure you, everyone was at least ten pounds lighter two hours earlier. Give it a try Joei! 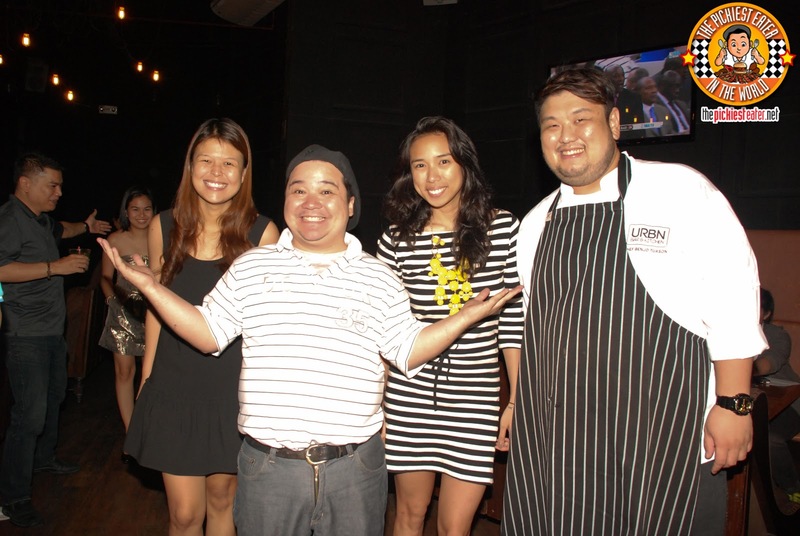 Check out the pic of me, Chef Benjo, May & Patricia.. far left side behind us you'll see GSM making "Da Movez".. "Come to me, Ija..."
Can't wait to read your post, Sumi! Wonderful to hear bro! Share your post here when you write it! Hello sir, thanks for this post. This really helps since I was looking for places to go with my girlfriend. Anyway, I would just like to ask, how much was the Dry Aged, Bone-In Rib Eye? Didn't see it on the menu. Thanks! Glad to have been of help, Marnel! 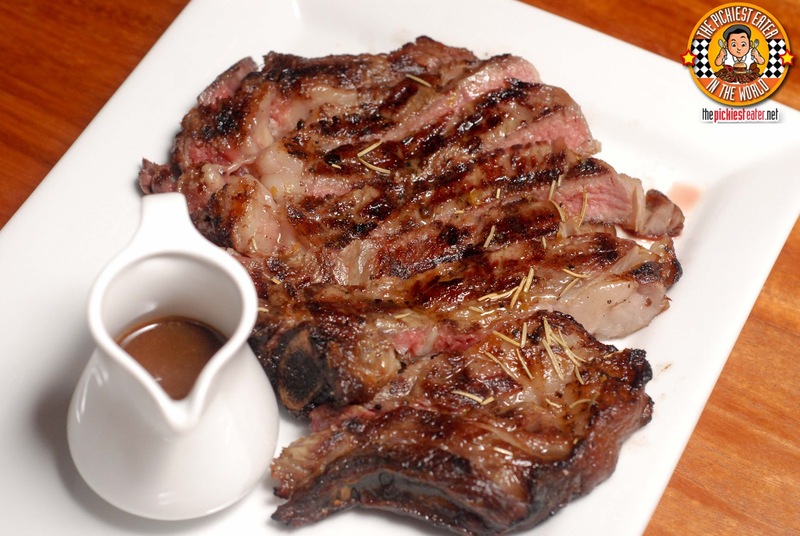 When we tried the Ribeye, it wasn't on the menu yet.. but I think it comes out to around P2,500 ++! hi! how's the serving? is it good for sharing?